Back when I was a lad growing up in New York City - in the long ago days before Netflix, movies on demand, cable television, and what have you - choices as to what movie to watch on St. Patrick's Day were severely limited. 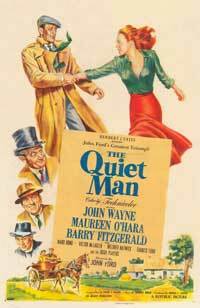 In fact, there was only one choice, and that was The Quiet Man with John Wayne, Maureen O'Hara, and Barry Fitzgerald. One of the local television stations showed the movie every year on St. Patrick's Day, some time after the parade had ended. Now, of course, we have more choices, but I would still go with The Quiet Man as my first choice. The film was made in 1952, also stars Victor McLaglen as the unforgettable brother of the lady our hero loves, and John Ford won an Academy Award for Best Director. The Luck of the Irish - This is a fine film with a message perhaps even more timely today than when the movie was made, starring Tyrone Power, Anne Baxter, Jayne Meadows, and Lee J. Cobb. When the movie was originally released in 1948, the scenes in Ireland were shown with a green tint, while the rest of the movie, with scenes in New York, were shown in regular black and white. Leap Year - A very pleasant and charming romantic comedy, starring Amy Adams and Matthew Goode. Goode is quirky, Adams is lovely, the scenery is beautiful. The plot is a bit on the predictable side, but the movie is nevertheless delightful. Tonight's the Night (1954) - This movie, starring David Niven, Barry Fitzgerald, and Yvonne de Carlo, is a great deal of fun. Don't worry, Niven doesn't try to do an Irish accent; he plays a character who has lived most of his life in England, and his interaction with the Irish locals is what propels the story line of the film. The Matchmaker (1997) - Looking for an understated romantic comedy for St. Patrick's Day? Look no further than this movie, starring Janeane Garofalo, David O'Hara, Denis Leary, and others. Ms. Garofalo plays an American in Ireland, and the script is a very good one. The Secret of Roan Inish (1993) - A truly Irish movie, a drama with a compelling story, great acting, and beautiful scenery, it's the kind of movie you watch and then try to convince others to see (which is, I suppose, what I'm doing here). Besides traditional films - and there are many fine Irish-themed movies I've not listed here - consider Irish music DVD's as well. Music is a great part of Ireland's culture, and you cannot go wrong with something like Absolutely Irish (2008). If you're in a more serious mood, there are also films related to Irish history, such as Out of Ireland (1994). I hope the above ideas get you thinking in the right direction, and wish you a Happy St. Patrick's Day, be it early or late for such felicitations when you read this.